The Printing Works opened in September 2010 as a live exhibit in the attractive village setting of the Cobblestones Museum and we celebrated our 8th anniversary on 25 September 2018. ​ Our object is to display and demonstrate the ​technique of letterpress printing, using the type and tools of the trade that have been used for centuries. The Works is equipped with seven working presses from small table-top presses to two large treadle-powered platen presses. The fonts of type range from text size, through to large wood characters typically used for posters. Visitors can enjoy a print on one of these presses ! and all students have the opportunity to print. A school resource kit is also provided which covers the evolution of the alphabet, word search and 'Scrabble' packs, and "mind reading" challenges. The layout of the typecase showing the most frequently used lower case letters - largest compartments - grouped together for quick selection with one hand while the other holds the composing stick. 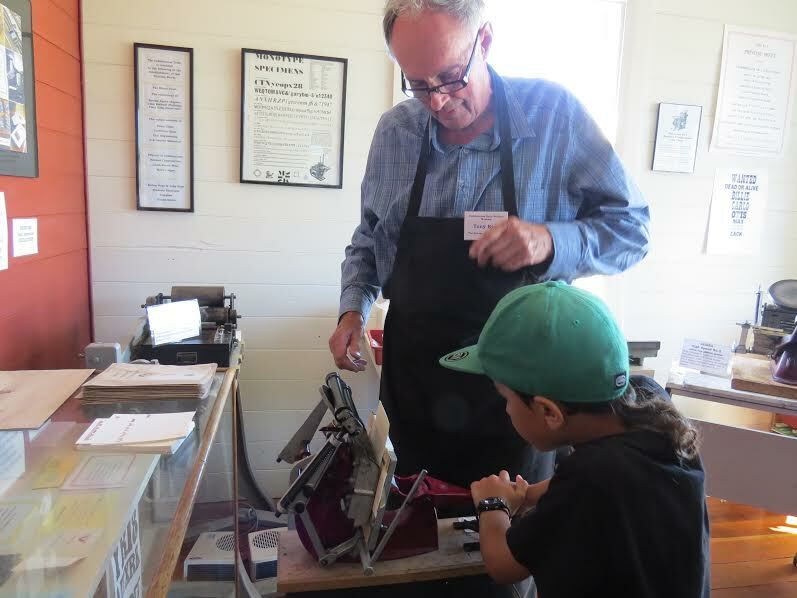 The Printing Works enjoys numerous group visits to the Museum particularly from schools when students are shown the way of life in the Wairarapa almost a century ago, compared to today. Visits by tour groups, many in post-conference programmes, senior citizen, art and service groups are regular. In the Printing Works they learn of the roles of those working in the printing industry decades ago and the techniques involved. The process of setting type and preparing it for the press was captured on film in October 2018 as a sequence for a forthcoming documentary marking the anniversary of the Women's Suffrage movement. School group visits are popular. Students from Solway Primary School, Masterton, Ponatahi Christian School, Carterton Primery, Hadlow Preparatory School Masterton, Kahutara Primary, and Berhampore Primary school from Wellington visited in 2018. In September 2018 sequences of traditional letterpress printing were filmed for TV documentaries by two companies. ​ Full-day workshops are popular with participants in recent months from Wellington, Hawkes Bay and Featherston. Workshops can be held in other locations. A graphic art tutor from Featherston used her workshop time in November to print items for the local primary school fair. The Works was a hive of activity for the Museums' 2018 Activities Day in October....and we had a dose of Steam Punk!